So, you’ve decided to go for it and run the Bank of America Chicago Marathon? Great idea! Chicago is one of the most beautiful cities for an urban marathon with plenty of green cityscape for a comfortable yet scenic run. Whether you’re a seasoned runner and have 99 marathons under your belt or are preparing for your first race ever, there are some essential marathon training tips you should follow regardless of your level of expertise. Use these guidelines as a fitness compass 1-2 months before marathon day to help prepare your body for this long-distance race. Finding a fitness plan that suits your lifestyle and schedule and following it is crucial. A detailed plan will prepare you for the coming weeks of a marathon and help you build a routine to strengthen your stamina and commitment to the race. Without a plan, it’s easy to slack and lose sight of your goals, especially if you’re tired from work or have had a rough day. A written plan allows you to track your progress and determine if you’re hitting specific goals pertaining to your running. Plus, a plan is easier to follow methodically versus just running when you feel like it. 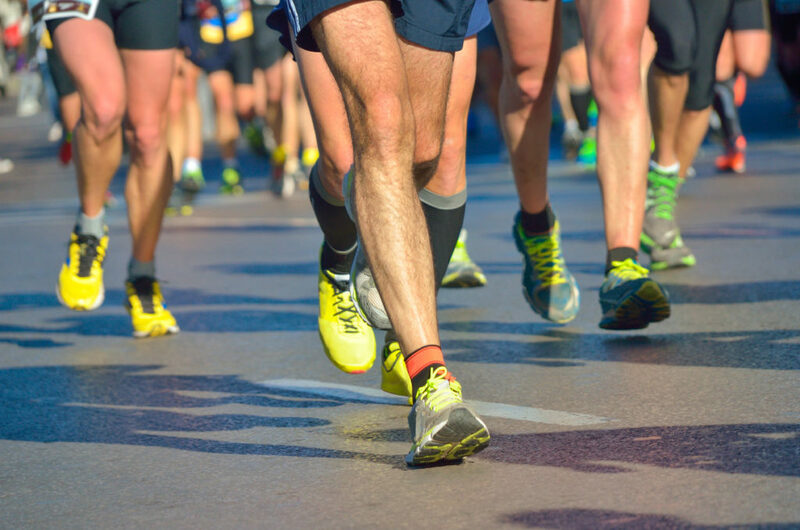 Runners who are just getting into marathon running tend to focus solely on the strength of their legs and feet. While training your legs is important and crucial for a successful race, you should not forget the rest of your lower body such as your glutes and lower back, which are the support bridges of your legs. So, make sure to get in at least 1-2 times a week of lower body strength training. Squats, anyone? It can really help with longer distance races like a marathon. Oh, and remember to foam roll. A lot. After all, what’s a great dinner without an even better dessert? Running in shoes that don’t fit your true foot size or arch can really impact your running form and cause injuries down the line. Beginners especially don’t think about this because they may be used to running in their one favorite pair of shoes and don’t think anything of it. Getting professional advice could offer insight into whether your current shoes fit well and if they support your feet adequately enough to run longer distances. Bonus: If possible, try to also get your running form looked at by a chiropractor or sports therapist. An incorrect running form can cause shin splints, among other common running-related injuries, especially if you have existing foot conditions like plantar fasciitis. For the couple days leading up to the race, you should be loading up on those extra carbs – but don’t overeat! Since you should have started tapering 2-3 weeks before this, you don’t need to eat any more food than you normally would since your weekly mileage at this point before the race is drastically reduced. You don’t want to put on extra weight as fat during this time. Also, avoid experimenting with new foods the day or two before the race. You don’t want to cause any digestion issues for race day. Eat what you normally do. The weather in Chicago is wacky, so expect race day to be warmer or colder than expected and plan your hydration and attire accordingly. Likewise, remember to split the race up into two halves and try to pace yourself so that both halves are about the same pace. Ideally, your first half would be slightly slower than your second so that you can finish strong and not burn out quickly. They say that the halfway point in a marathon is mile 20 because of “the wall”. This last part of the race is very much a mental part. To help you battle through the last 6-10 miles, be sure to keep drinking plenty of water and always eat bananas or gels during the race when they’re provided. Gatorade and Nuun (or whichever drink is offered during the race) also help. These tips should keep you in tip top shape for running your best marathon yet. However, these suggestions should not be a substitute for medical advice, so if you have any concerns or questions, always consult your doctor first! Our Chicago DPM doctors are here for you before, during and after your training regime. While we ultimately hope to help you avoid injuries from running or jogging or training, we all know that no one can’t eliminate them. If you have any questions, please request an appointment today.